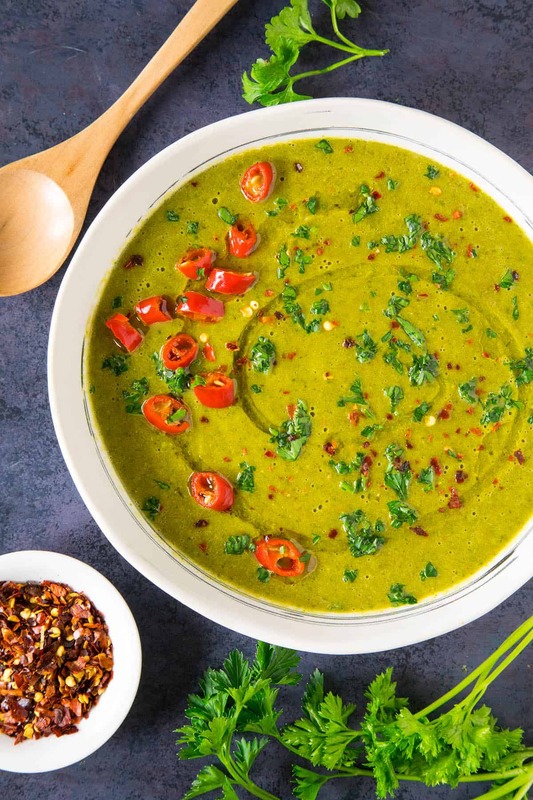 A recipe for earthy poblano peppers, roasted and peeled, simmered with onion, celery, carrots and spinach with the perfect seasoning blend, then pureed for a wonderfully creamy soup. Break out the bowls! What’s up, my friends! Now that we are well into soup season – at least we are were I live – I’m excited to post this recipe because I already know it’s going to be one of your new favorites. This soup is luscious! It’s creamy and smooth and earthy and just the right amount of spicy for my spicy food loving friends. Oh my, just take a look at it. So vibrant and inviting. I want dive in again. I grew poblano peppers in my garden this year, hybrids actually – Tiburon Hybrid Chili Peppers – and DANG were those plants productive! 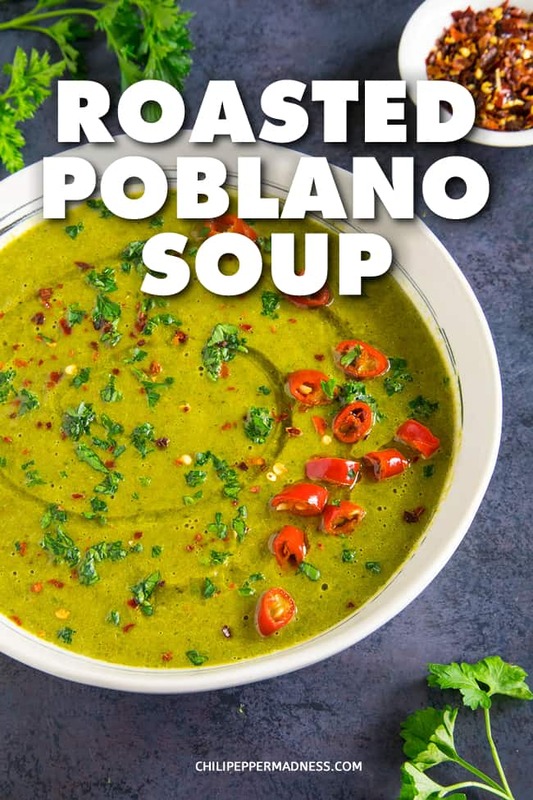 I got a TON of poblano peppers this year, so lucky me, I get roasted poblano soup as much as I want this year, along with all sorts of other wonderful poblano pepper recipes. Let’s talk about how we make this amazing soup, shall we? The first thing we want to do is roast our poblano peppers. First, set your oven to broil. Slice the poblano peppers in half lengthwise and place them on a lightly oiled baking sheet, skin sides up. Broil the poblanos about 15 minutes, until the skins char and blacken. They should puff up. Remove, cool slightly, then peel off the skins and discard them along with the seeds and stems. Rough chop the poblanos and set them aside. 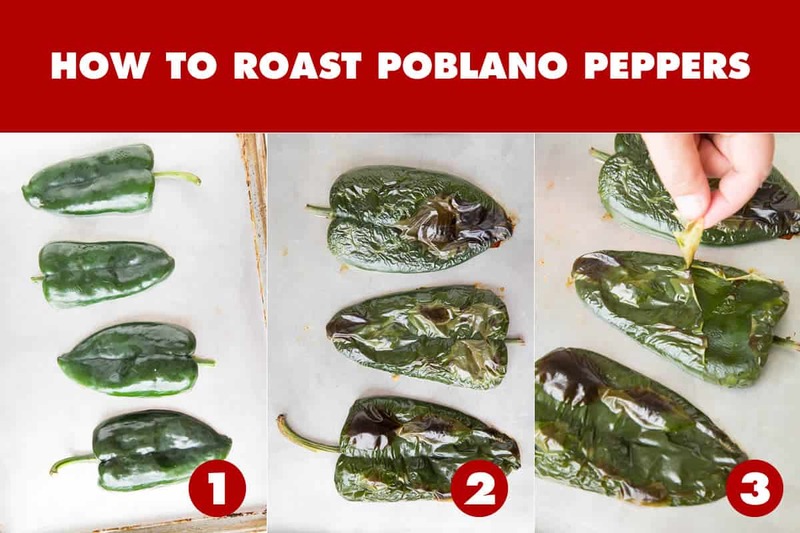 Learn more about How to Roast Poblano Peppers here. While the poblanos are roasting, heat a large pot to medium heat and add the olive oil. 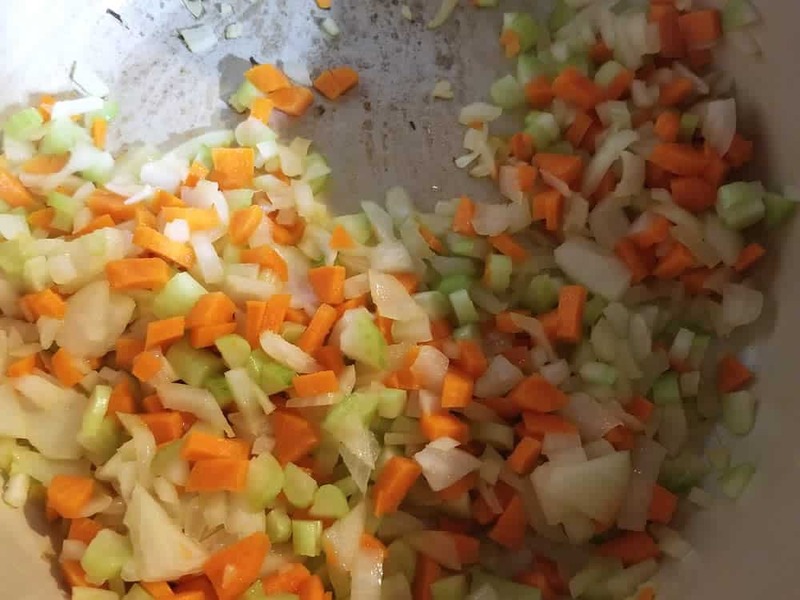 Add the onion, carrot and celery and cook them down about 5 minutes to soften. Add the chopped roasted poblano peppers, garlic, spinach, Cajun seasonings and salt and pepper. Cook another minute, stirring. I use my own Homemade Cajun Seasoning Blend for this recipe. Add the chicken stock and milk and bring to a quick boil. Reduce the heat and simmer about 30 minutes to let the flavors develop. Remove from heat and stir in the crema or sour cream until it is completely incorporated. 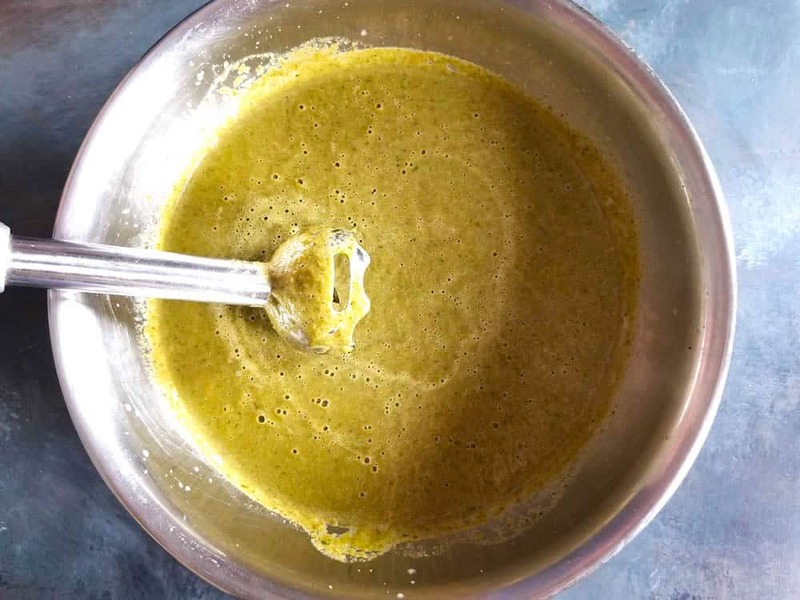 Use a stick blender to blend the soup into a thin consistency, or transfer it to a food processor or blender in batches. Serve in bowls and garnish with chili oil, chili flakes, pepper slices and fresh chopped parsley. That’s it, my friends! 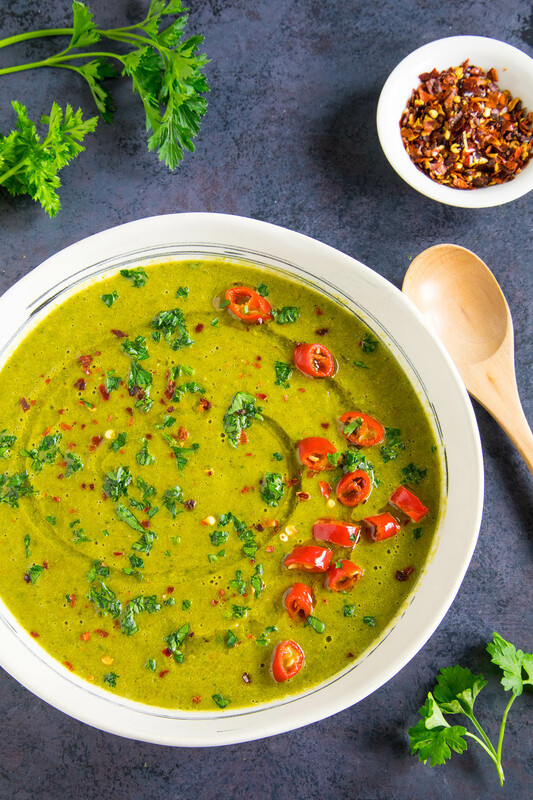 Roasted Poblano soup! It’s so crazy good, I hope you love it as much as I do! Set your oven to broil. Slice the poblano peppers in half lengthwise and place them on a lightly oiled baking sheet, skin sides up. Rough chop the poblanos and set them aside. Add the chopped roasted poblano peppers, garlic, spinach, Cajun seasonings and salt and pepper. Cook another minute, stirring. Add the chicken stock and milk and bring to a quick boil. 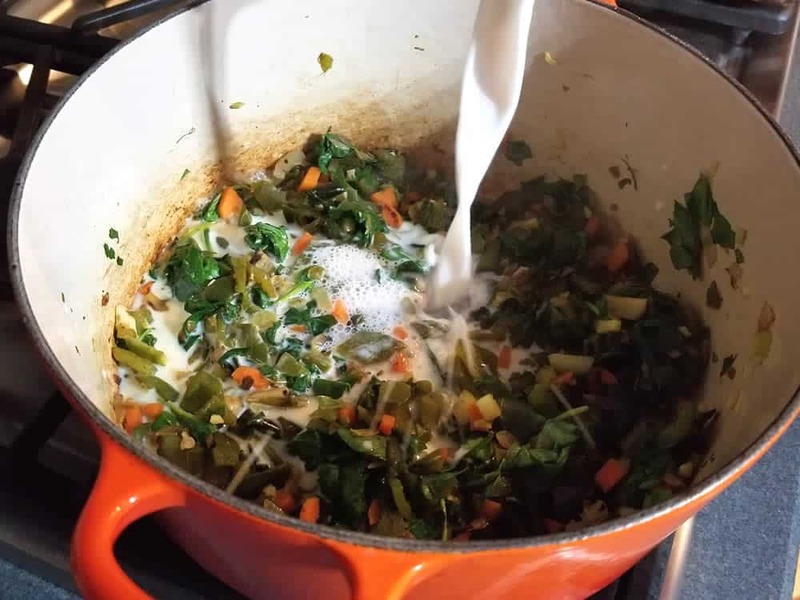 Reduce the heat and simmer about 30 minutes to let the flavors develop. Heat Factor: Mild, though might get a bit of kick from the poblanos and spicy chili flakes. You can easily incorporate hotter peppers, either roasted or cooked with the mirepoix, to increase the heat. Dave, this will serve up 4 small bowls, or 2 good sized bowls (double portion) for some hungry people. Absolutely great. My only problem is finding relatively fresh poblanos. The old wrinkled ones don’t peel very easily. Thanks. Yes, I think this would be more difficult with older poblanos. Looks fabulous! There’s enough going on on Thanksgiving, so I’m going to make this tomorrow and stash it away to really let those flavors get happy. I’ll steep a couple of split Thai Bird chilis in the chicken broth tonight, being super careful to strain the broth before adding to the soup. Thanks for a great inspiration! Happy Thanksgiving from Idaho! Awesome, Lizzie! Making my mouth water here! It was wonderful! 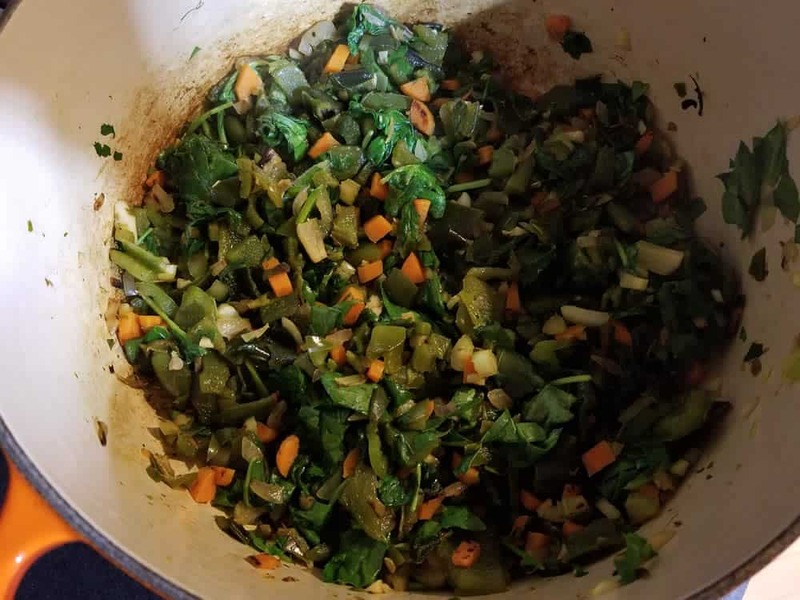 But not as bright green as your pic, so the next time I make it, I’ll add the spinach when I blend the soup, so it won’t be cooked, and hopefully will be brighter green. Big hit!!!! Outstanding! Glad you enjoyed it! Thank you for the recipe , I will cook it today . There are too many amazing recipes on your site, this is heaven for chili peppers lovers! This one seems a great recipe, I want that for tonight! unfortunately, this year, my Poblano plants did not grow. Can I make the recipe with rehydrated ancho chilies, without betraying the recipe? Thanks, Jeremie! I would use fresh peppers for this recipe. You CAN use rehydrated anchos and it would be very delicious, but it won’t have the same flavor. But still super tasty! Let me know how it turns out for you. Great soup! The ancho I have was worst that I thought, because it was not whole desiccated ones but just flakes. Soup color wasn’t nice, too dark because of the ancho solution. But the soup was full of flavor, yummy and well-balanced. I add Golden Cayenne slices in it. What the ancho seeds bring, I think, is some roasted hazelnuts flavor, but I definitively look forward to test the soup with fresh poblanos! Sounds great, Jeremie! Thanks for reporting in!